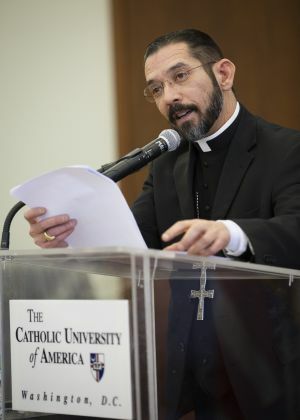 In a lecture Feb. 24 at The Catholic University of America in Washington, Bishop Flores wove together theology, personal stories from people at various stages of the immigration continuum and philosophical perspectives of several novelists. Drawing from material by novelist Walker Percy, Pope Francis, Pope Benedict XVI and other writers, Bishop Flores also sprinkled his remarks with references to the play and movie “Into the Woods.” He drew a comparison between the comparatively ordinary lives of Hobbits and the more exotic existence of other magical creatures of the “Lord of the Rings” books and put his thoughts in context of the work of St. Thomas Aquinas. Bishop Flores framed a challenge to the church and to all who believe in Christ’s model of justice, saying they are called to break free of “paralysis … the human affliction of our time,” that keeps people from acting to protect those most in need. Bishop Flores’ talk was the third annual Hispanic Innovators of the Faith Lecture at the university. A native of the Mexican border region of Texas, he heads a diocese that was in the apex of the surge last summer of unaccompanied minors and family immigrants from Central America that overwhelmed governmental and social service resources. He illustrated his more theological and philosophical points with stories of individuals he met in immigrant detention centers in the U.S., in a shelter for repatriated youths in Honduras and in a Guatemalan community of people determined to make a better life for themselves amid poverty and violence in their country. Bishop Flores distinguished between the “economically and technologically advanced West,” or ETA West as he called it, that defines the lives of most North Americans, and the more struggling version of the West experienced by the poor of Central America. A feature defining the ETA West is a sort of inertia brought on by the many distractions of society. “As a novelist, Walker Percy (shows) us modern persons in motion, or at least attempting to move. His characters are individuals, flawed, self-consumed at times, anxious, yet longing to get over some kind of internal paralysis. Paralysis is for Walker Percy, the human affliction of our time,” Bishop Flores said. Some of Percy’s characters are severely paralyzed, he observed, while others are “more or less paralyzed, depending on how successful they are in regaining self-possession of themselves as selves. He said that people on a pilgrim journey of faith and immigrants — while on distinctly different types of journeys — both depend upon God and the people they meet along the road, he said. Bishop Flores described talking with many immigrants who told of having been helped on the road by someone they believed God put in their path. Some credit St. Toribio Romo, considered a patron and protector of immigrants crossing into the U.S. from Mexico. Yet, he added, “sometimes we in the church in the ETA West can smugly ask the immigrant church to assimilate to the customs and habits that are our own. We ought to pause before facilely insisting upon such a demand. For in doing so, we may in some way be asking them to abandon a Christ of flesh and blood for a gray pragmatism of indecisive small-mindedness. “Perhaps we have become too accustomed to our five-story office buildings, our myriads of forms to fill out, our recorded messages on phone lines and our endless meetings to discuss whether we will actually do something,” he said. “No, we must take seriously what the Holy Father says when he urges us to let ourselves as a church be evangelized by those whom we are asked by God to receive hospitably. The immigrant changes by being with us. The question is, are we willing to change because we are with the immigrant?